Send “flowers” they can eat. 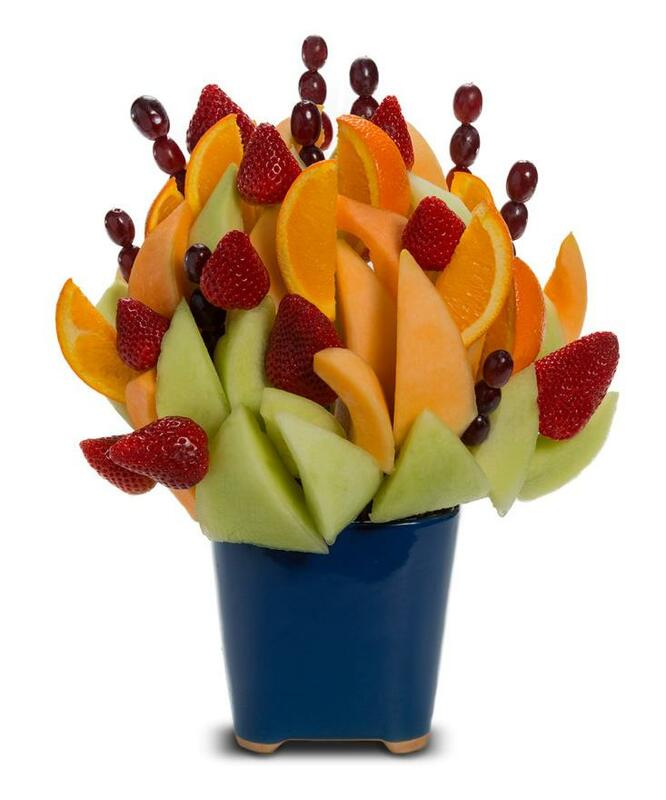 Our fresh fruit arrangements are the perfect alternative to flowers! 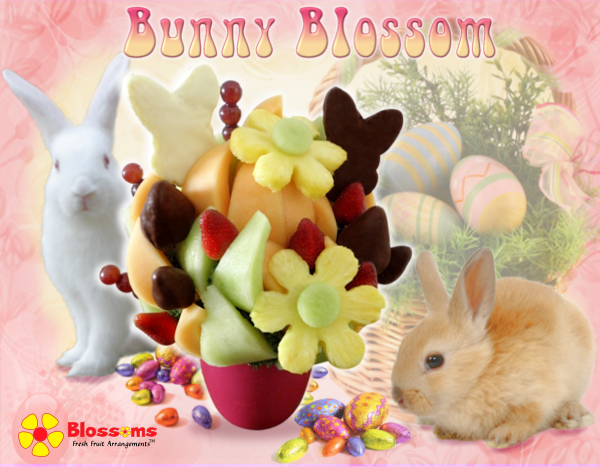 Here at Blossoms Fresh Fruit Arrangements, we design nourishing fruit arrangements that are great for any occasion from Birthdays and Mother’s Day to Valentine’s Day and Christmas. 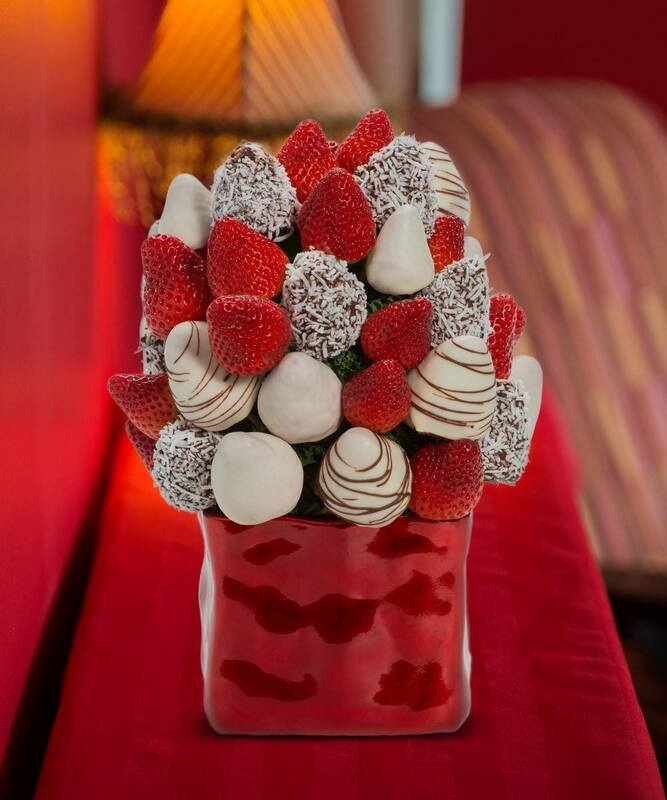 Try our chocolate dipped strawberry arrangements. Yum! What Type Of Blossom Are You Looking For? Send this arrangment out to your favorite Valentine! Something to share or maybe you’re away and can’t be with your sweetie. Don’t forget to do something special for your Valentine on this day of love or you’ll be browsing our doghouse arrangements. Let me call you sweetheart. Still in love after all those years? Is his snoring endearing yet? If you have a sweetheart for years or just got a new sweetheart, then this is the perfect gift to tell them how much you care. 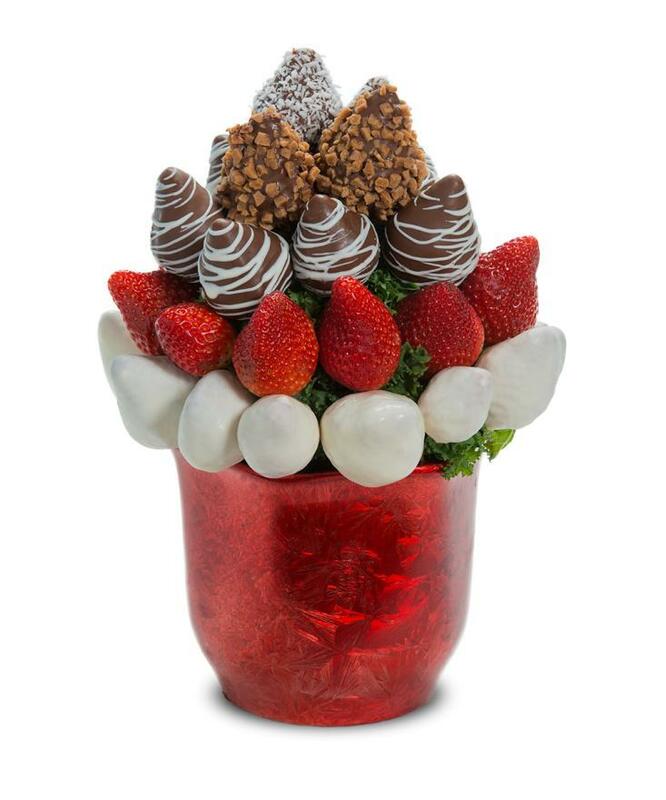 Your friend will enjoy the mouth melting chocolate dipped strawberries in this arrangement. 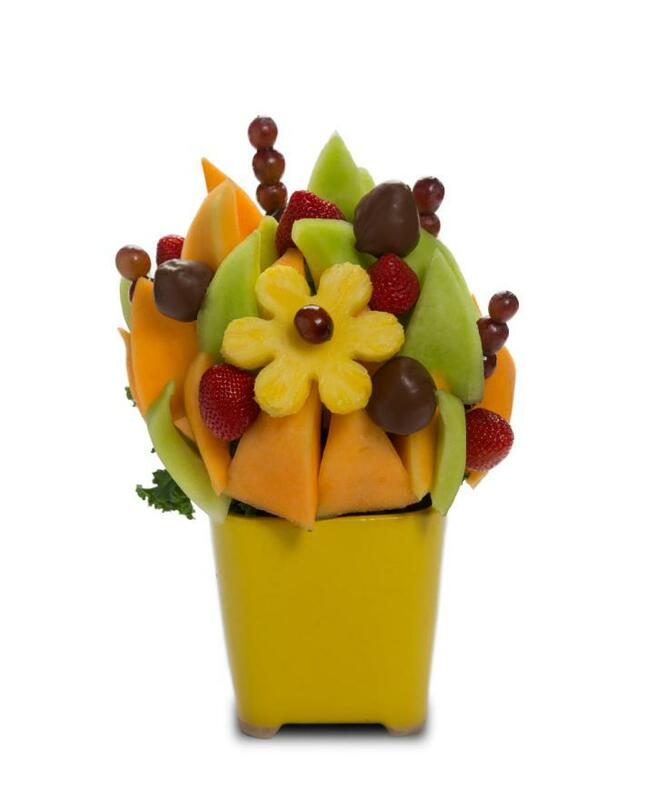 Send this fruit bouquet to anyone who melts your heart in a friendship kind of way. How much do you love thee? This bouquet is bursting with love! 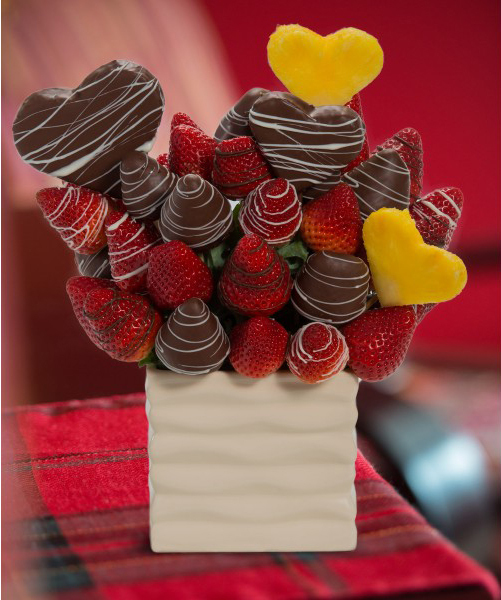 Succulent strawberries combined with pineapple hearts, best of all lots of chocolate. You will earn lots of brownie points. Or should we say strawberry chocolate points? Now that’s a bunch of strawberries! What did the strawberry say to the other strawberry? If you weren’t so fresh, we wouldn’t be in this jam, lol. This jam-packed delight of berries is sure to impress all. Bought two arrangements for friends at the coast and they were both a huge hit. Thank you for staying late and making them fresh for us to pick up this morning and take one to Chilliwack and one to Burnaby. Totally awesome. 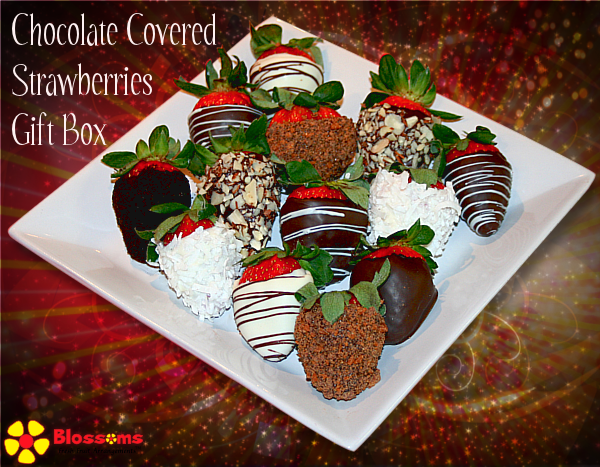 A box of strawberries for any occasion! Did you know the heart began symbolizing love as early as 1250? What better way to say I love you, with lots of pineapple shaped hearts. 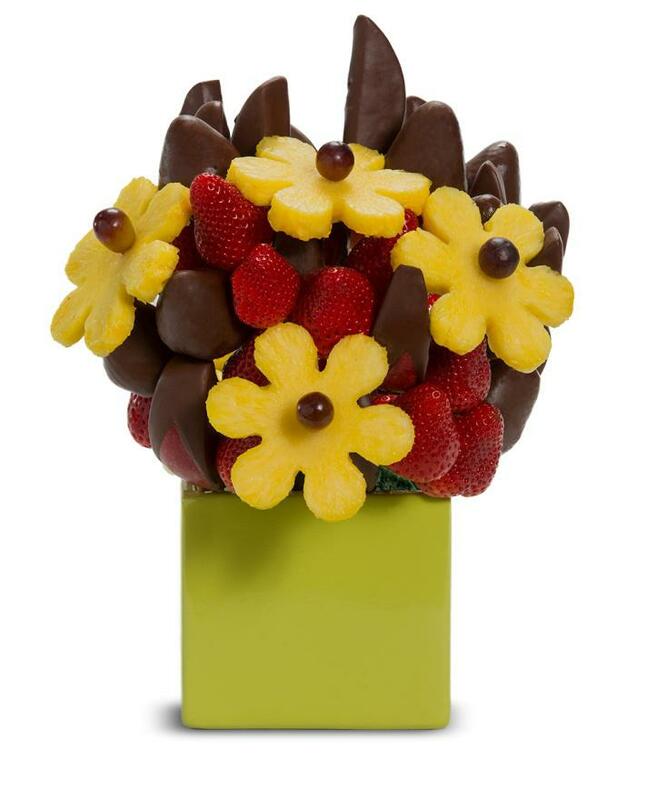 They will love this juicy tasty bouquet, full of strawberries and pineapple with an extra sweet treat of dipped berries. An excellent choice! 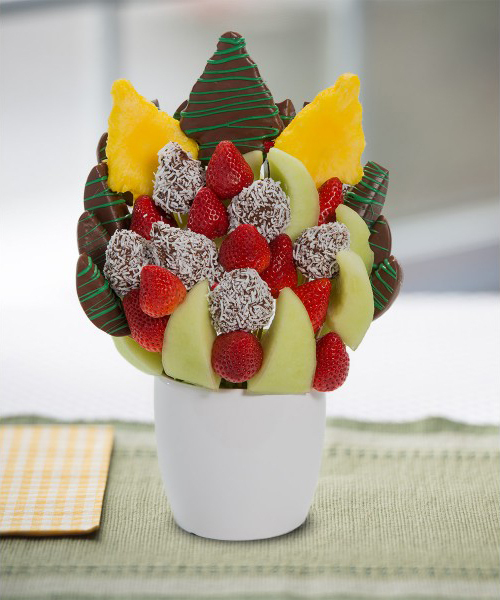 Embrace temptation with this luxurious mix of fresh fruit and chocolate! 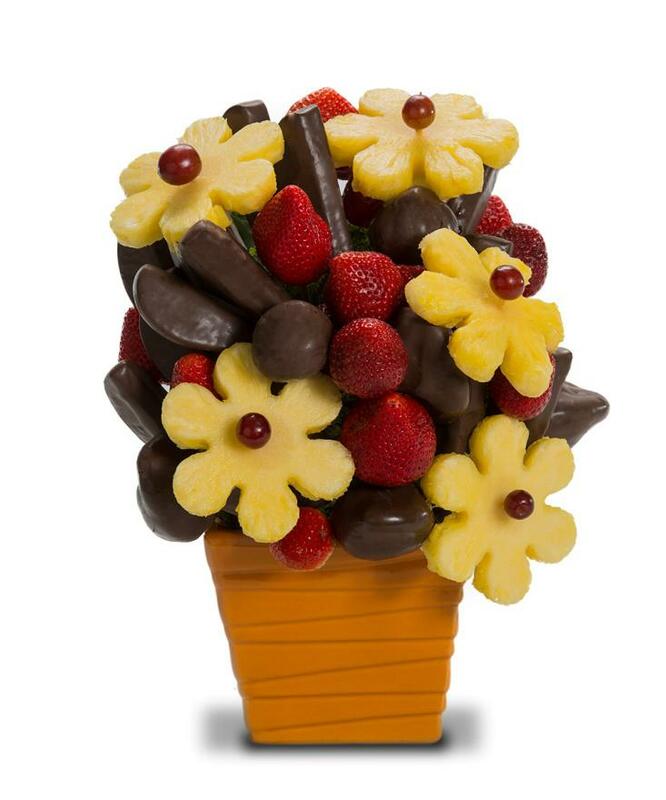 A sweet arrangement of pineapple daisies, and plain and chocolate dipped strawberries. Delicious! Enjoy this succulent variety of gorgeous fruit. This arrangement shows what beautiful Easter colors fruit can contain. Healthy and sweet this cute little Bunny can’t be beat! Have someone in your office that does a great job? Do you want to tell them how much you appreciate them? This is better than a box of chocolates, or flowers. 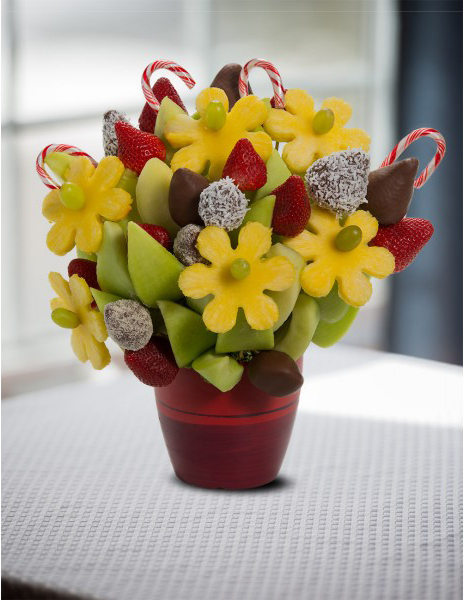 Send them a fruit arrangement, it’s the perfect gift! They’ll share it around the office and tell everyone how awesome you are! What happens if you eat too many Christmas decorations?You get “Tinsel”-itis! Don’t let this happen and have a Blossoms Fruit Arrangement for Christmas dinner. 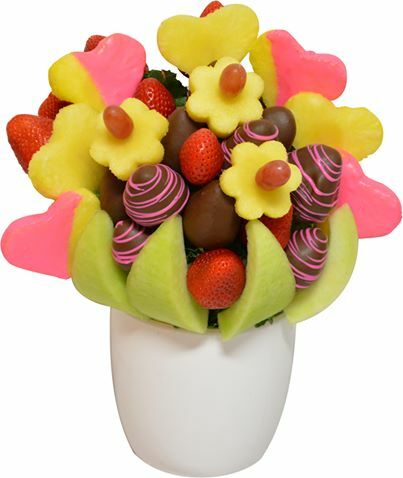 Lots of chocolate dipped fresh strawberries, juicy pineapple daisies and honeydew melons. The perfect way to wish anyone on your gift list a very Merry Christmas! Ginger breads were first made in the court of Elizabeth the first of England. She had them made and presented in the likeness of some of her important guests. If you’re having a party or attending a party, do it like royalty and send the Gingerbread Men Blossom. The guests are sure to enjoy the succulent strawberries, orange wedges and honeydew melon. We wish you a Merry Christmas, We wish you a Merry Christmas with a merry minty bouquet. Who doesn’t love mint chocolate that melts in your mouth, especially at Christmas. It will even freshen your breath if you’re standing under the mistletoe. Apple wedges dipped with mint chocolate, combined with an array of fresh fruit. A scrumptiously sweet treat to satisfy your sweet tooth and it’s healthy all at the same time! An array of beautiful fruit! 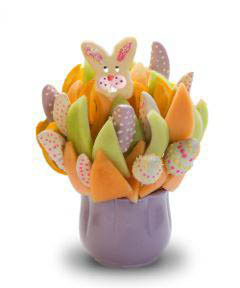 This wonderful Easter arrangement includes honeydew melon, cantaloupe, oranges and chocolate covered apples. Wish that person on your Christmas list a holly jolly Christmas; they will definitely be jolly after devouring these scrumptious juicy berries. Your favourite flake will enjoy any snow day with a bright fun blossom, filled with lots of melon and white chocolate dipped pineapple. A great treat to have beside a warm fire, but not too close it might melt, like it will in your mouth. What do snowmen call their offspring? Chill-dren! This is a great centerpiece or gift for that hard to buy person on your Christmas list. Send them a bouquet they can eat. It’s the cool thing to do. I had my first delivery of a fresh bouquet of colorful, bright, sweet & delicious fruit at my office. This was a nice change from the floral bouquets because I was able to share my love from my love with others. Thank you. The first printed reference to Christmas trees appeared in Germany in 1531. Now this is a fun fact to share at Christmas dinner, the whole table will think you’re smart. Send this great sweet gift to all on your list. Snow berries really do exist. You will find our snowberries much tastier though. They are succulent strawberries with white chocolate and coconut. Oh Christmas tree, Oh Christmas tree, how I can’t wait to devour thee. 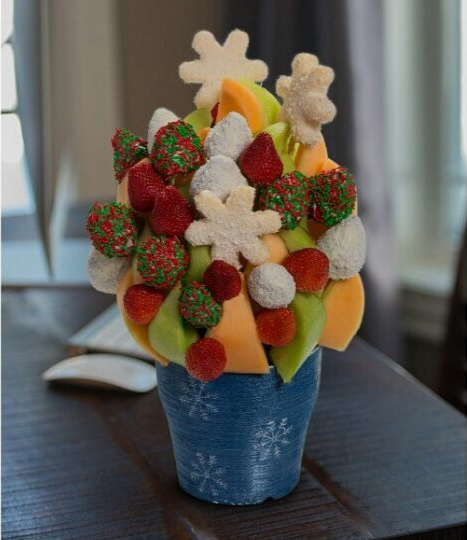 Juicy pineapple Christmas trees coupled with chocolate dipped apples, honeydew melon and strawberries, some are even rolled in coconut. What a great way to wish someone a Merry Christmas. 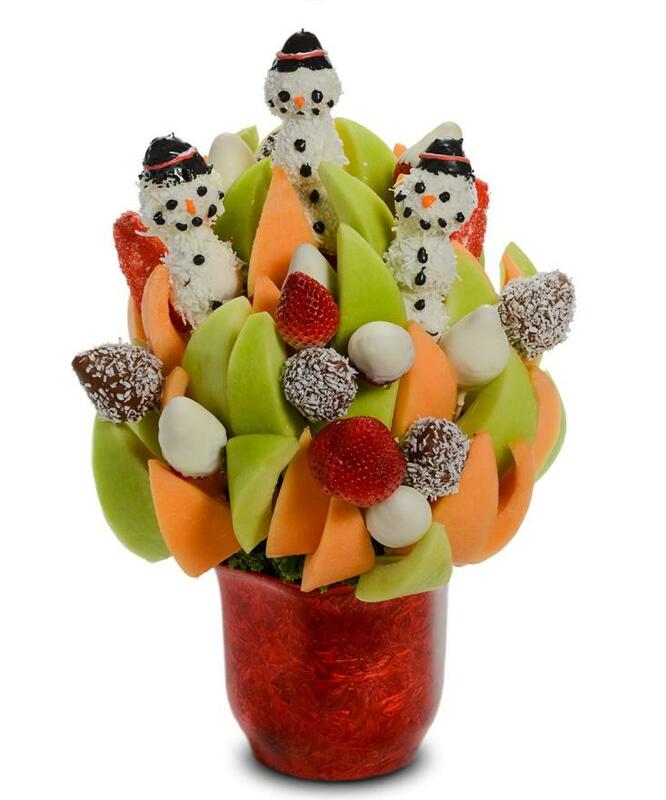 No two snowflakes are the same; this arrangement is as unique as the recipient. It’s a great gift for a Christmas party, Christmas dinner, or New Years Eve celebration. That unique person on your list will be sure to enjoy mouth watering pineapple dipped snowflakes, and candy coated milk chocolate strawberries. All moms are awesome aren’t they? Show your mom how special she is with the Mother’s Day Blooming Blossom. 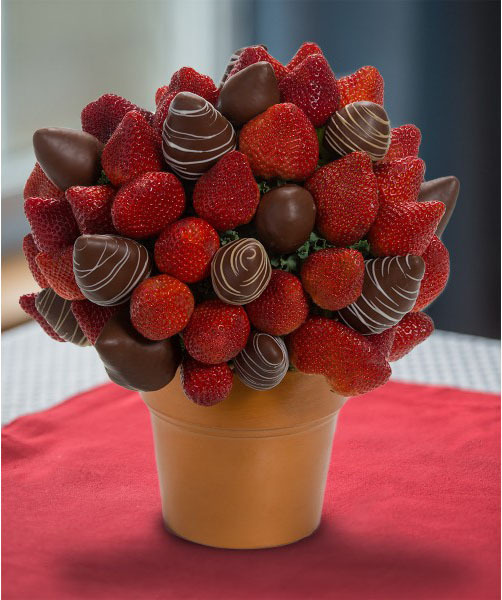 She can sit back on her special day and enjoy lots of chocolate; pineapple’s dipped in chocolate, melon and grapes, and fresh strawberries. I bet she wouldn’t mind this any day of the year, not just on Mother’s Day. Do you love your Mom? 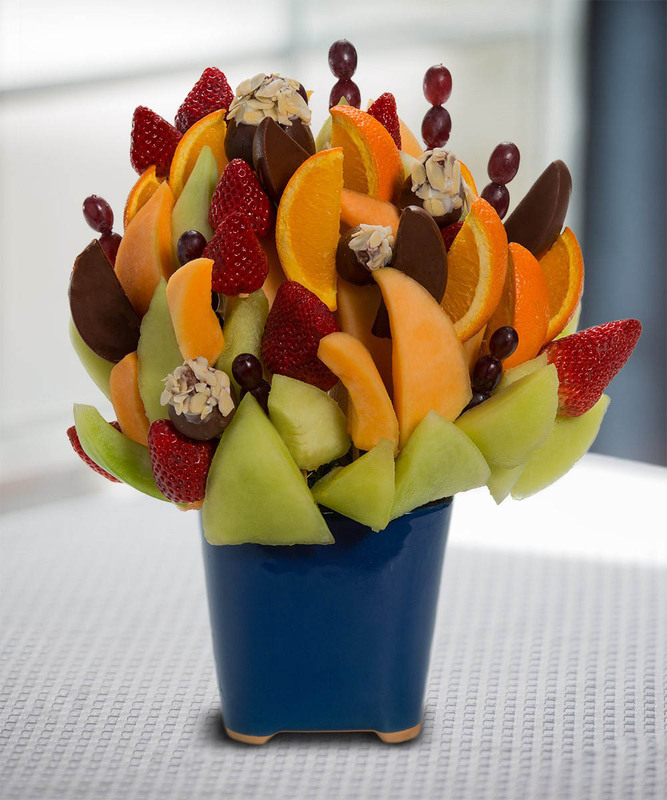 Send her this fruit packed arrangement of fruit for her to nibble on. She’ll brag you’re her favourite! What better way to say you love and appreciate everything that makes Dad so special. Chocolate dipped apples and strawberries are sure to please him. The next time you ask Dad to borrow money or the car, he is sure to remember this special gift. What could be better than giving Mom tulips and daisies she can eat? 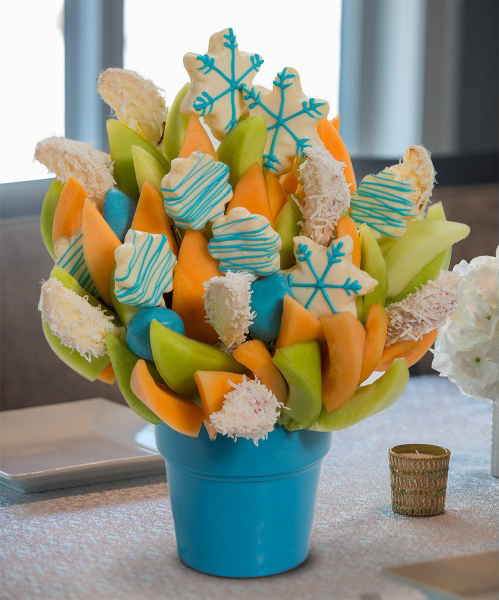 This arrangement is filled with yummy cantaloupe, honeydew melon, orange wedges and chocolate dipped apple wedges rolled in toffee bits and coconut. It is then topped off with plain and chocolate dipped pineapple daisies and tulips! There was once a cross-eyed teacher who couldn’t control his pupils, lol. Have a special teacher that you want to say thank you to? This is a great way to thank a teacher or caregiver for all that they do. Your kids are sure to get and A for these apple wedges! This store is amazing! I bought one of these arrangements on short notice. Very fresh produce, friendly staff and local. Thank You– “The word “Thank you” is a very old one. We have been using it for well over 1500 years. It comes from the same origin as German word “danke.” People have been thanking people for thousands of years. Do you have someone you want to thank? 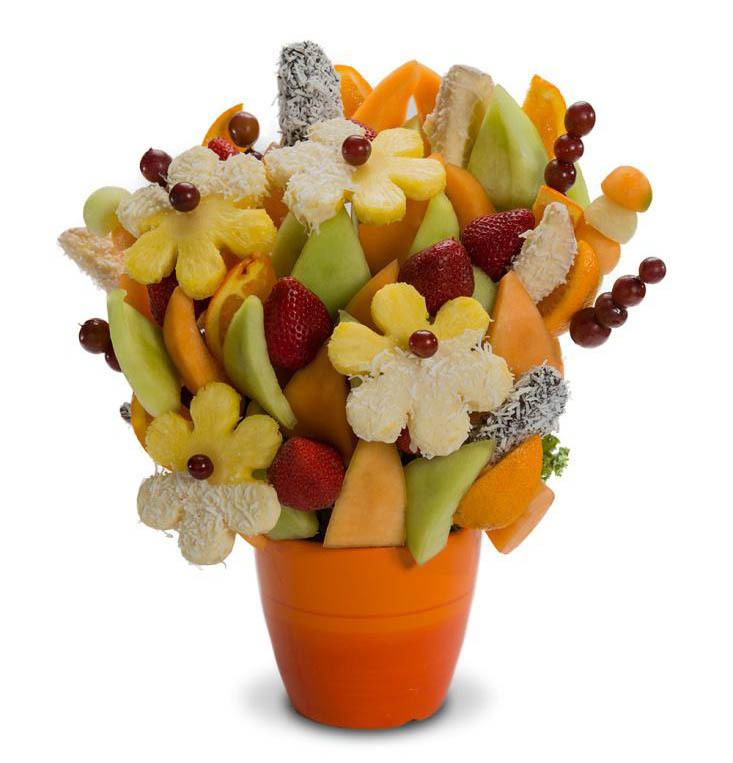 Send this fruit bouquet to say thank you! 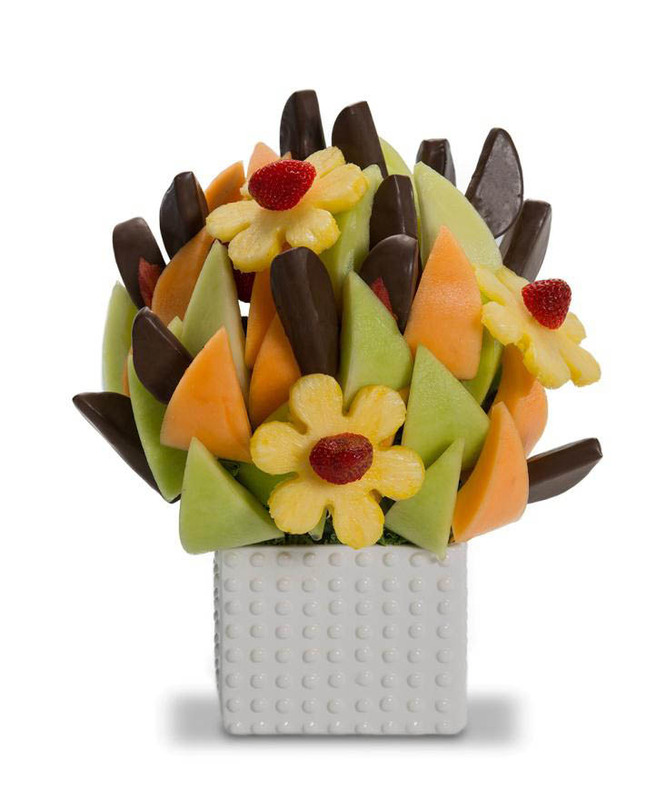 Fresh pineapple, chocolate/coconut dipped strawberries, cantaloupe and honeydew melon. What a wonderful way to show your appreciation of a job well done! 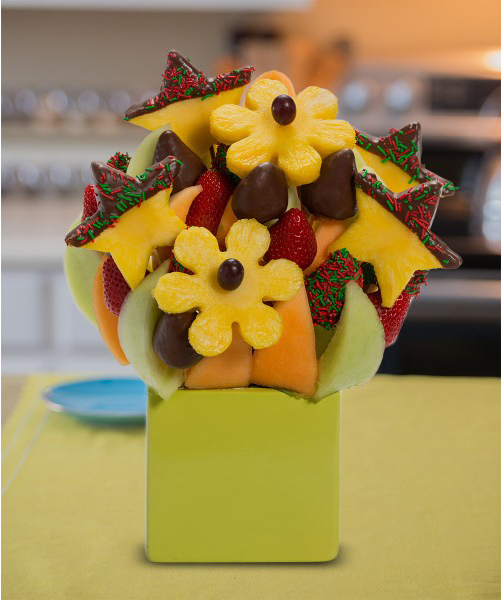 This thoughtful arrangement offers cantaloupe, honeydew melon, strawberries, pineapple daisies, and just the right amount of chocolate dipped fruit to satisfy any sweet tooth. 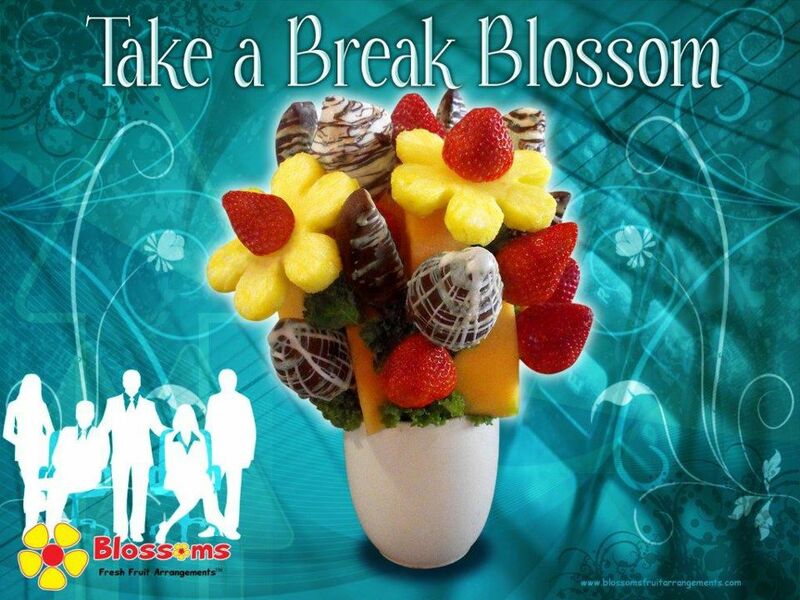 Be sure to send your administrative assistant a Blossom on Admin Professional’s Day for all the hard work they do. They will be sure to love the chocolate dipped apples rolled in sliced almonds. This may make up for you driving them nuts all year! What new mom wouldn’t want this beautiful arrangement? 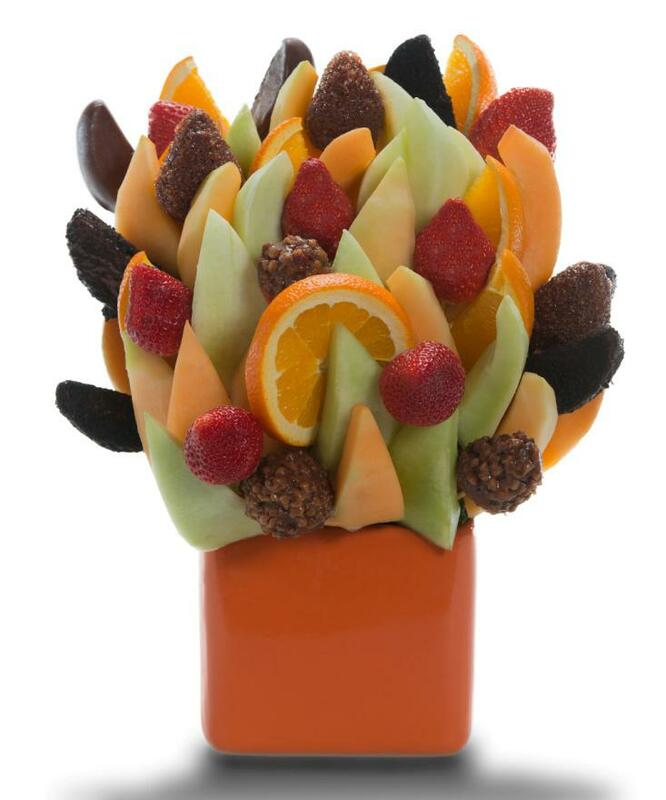 Packed full of energizing cantaloupe, honeydew melon, plain and chocolate dipped strawberries, oranges and grapes. Why not say Happy Birthday to that special someone with fresh honeydew melon, sweet cantaloupe, juicy pineapple, and succulent strawberries? This sure beats a cake, especially if they’re too old to blow out all the candles. 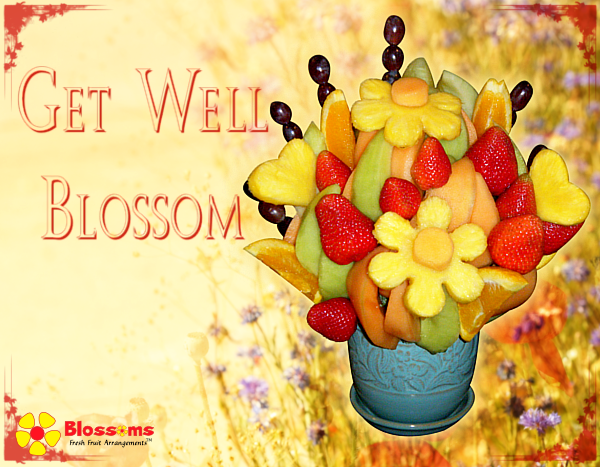 Send this colourful bouquet to the hospital to welcome the new addition. We can design this arrangement in blue, pink or yellow. Strawberries dipped in colorful chocolate, honeydew melon and cantaloupe. A sprouting garden of fresh fruit that is perfect for your anniversary dinner. Designed with fresh watermelon daisies, melon, cantaloupe, strawberries and oranges. Kids love cupcakes and the color purple! 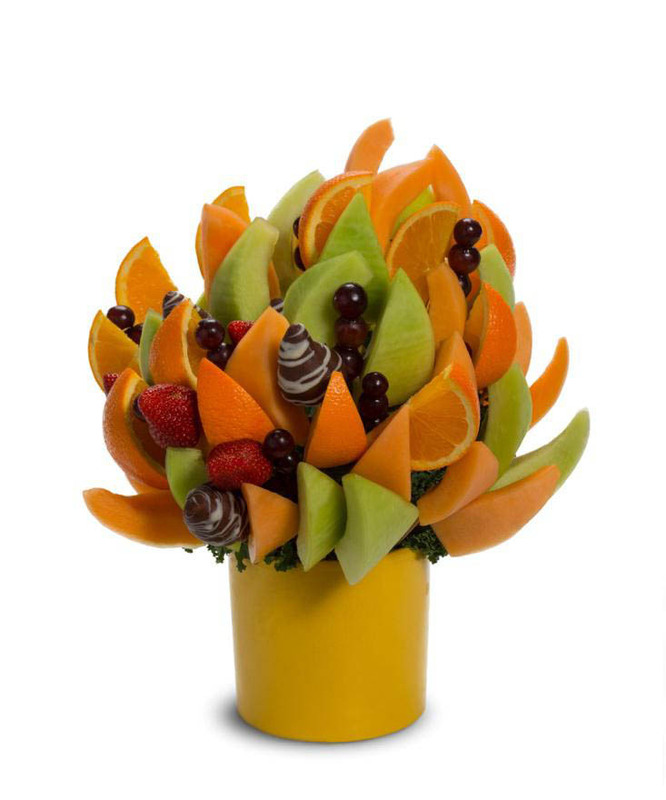 This fruit arrangement comes loaded with healthy chocolate dipped pineapple flowers, oranges and honeydew melon. 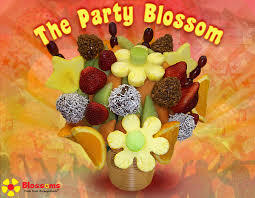 Celebrate in delicious style with this awesome Blossom! Delight your party guests with pineapple daisies, grapes, orange wedges, cantaloupe, honeydew melon, and chocolate dipped strawberries rolled coconut and toffee pieces! 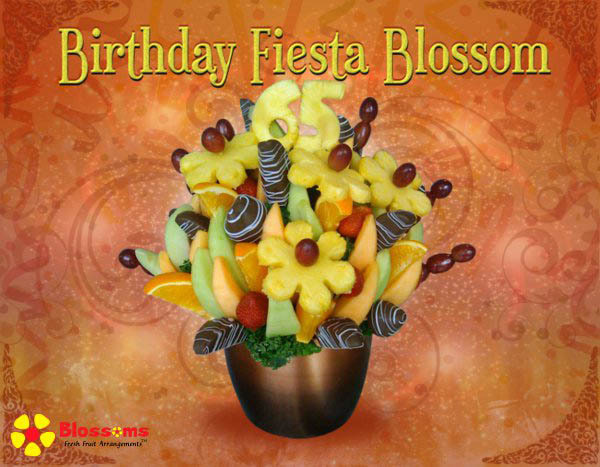 This Blossom makes the perfect gift or centerpiece for any birthday party! 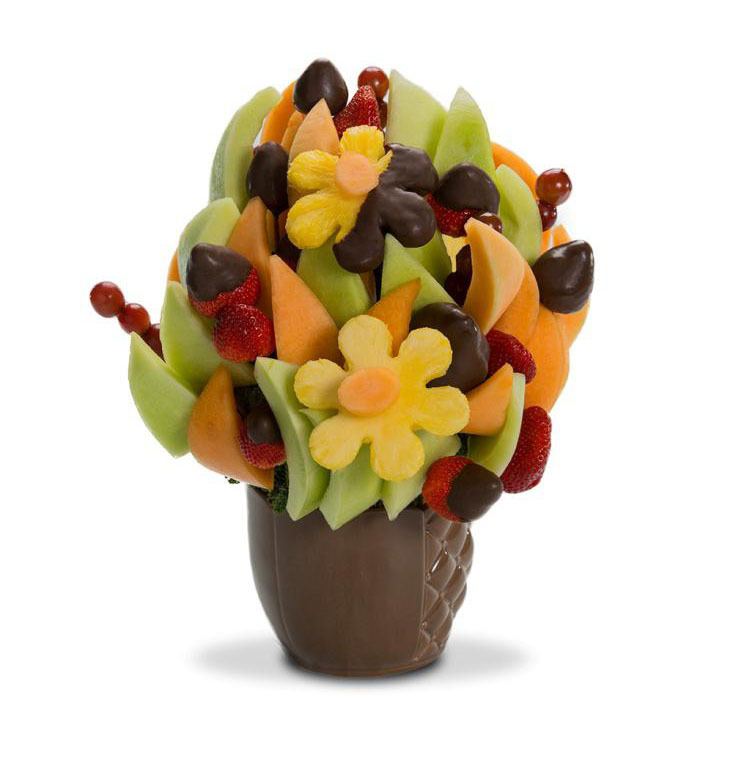 This jam-packed Blossom includes chocolate dipped apples and strawberries swirled with white chocolate, cantaloupe, honeydew melon, plain strawberries, grapes, and the recipient’s age cut into pineapple! There are so many reasons to have a fiesta and we all know someone who has a reason to celebrate. Birthdays, anniversaries, new job, new baby. The list is endless! 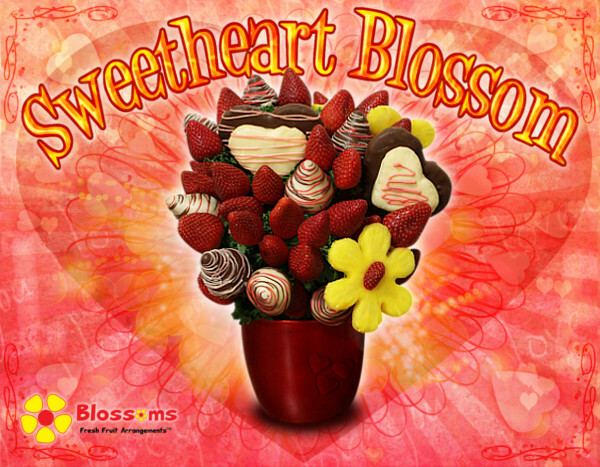 This Blossom is the perfect combination of fresh fruit and chocolate to tempt the palate! 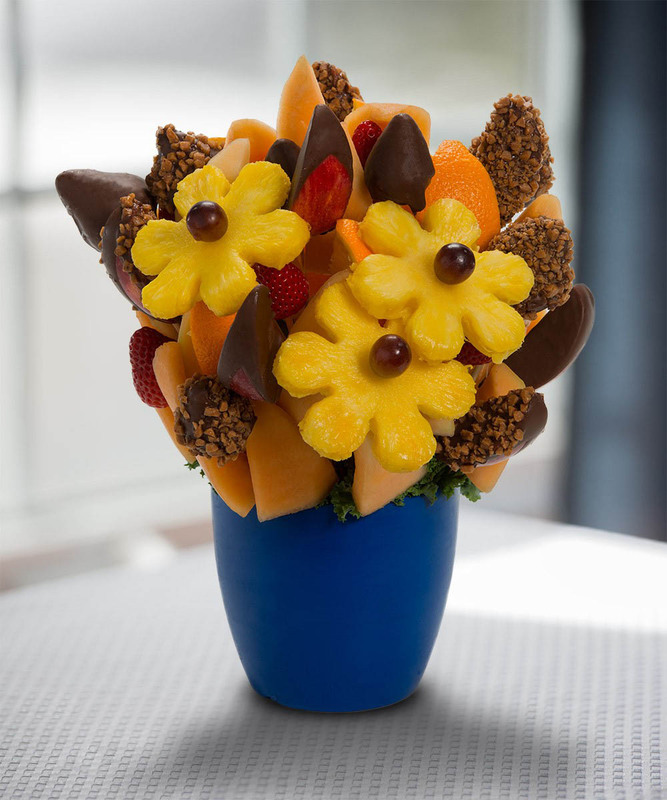 This beautiful arrangement includes pineapple daisies, wedges of apples and pears dipped in chocolate, strawberries, cantaloupe, and honeydew melon. 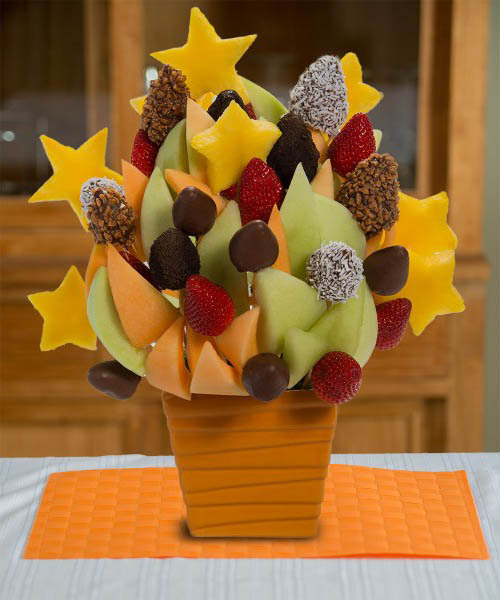 Delight yourself with this arrangement filled with orange slices, cantaloupe, chocolate dipped apples and strawberries. 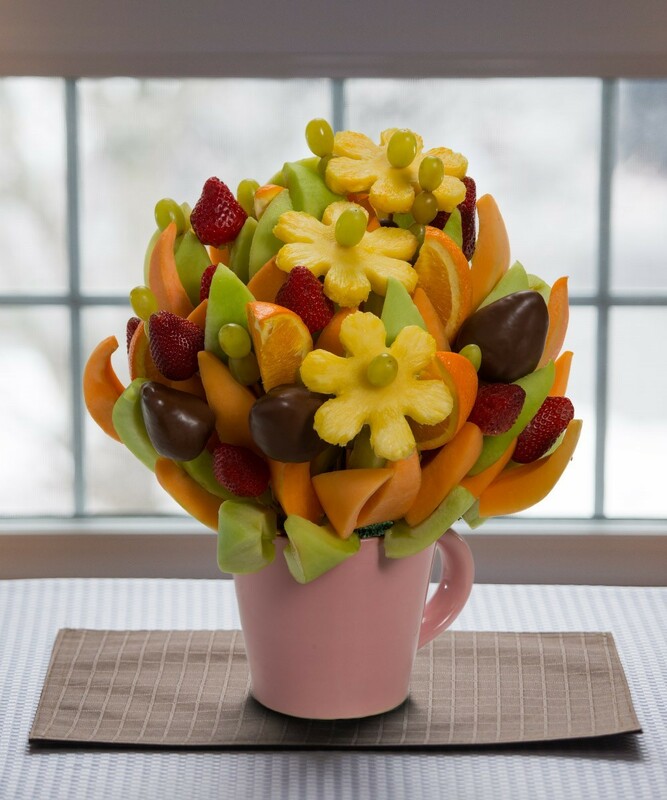 This vibrant Blossom is perfect for anyone who just can’t get enough fruit! 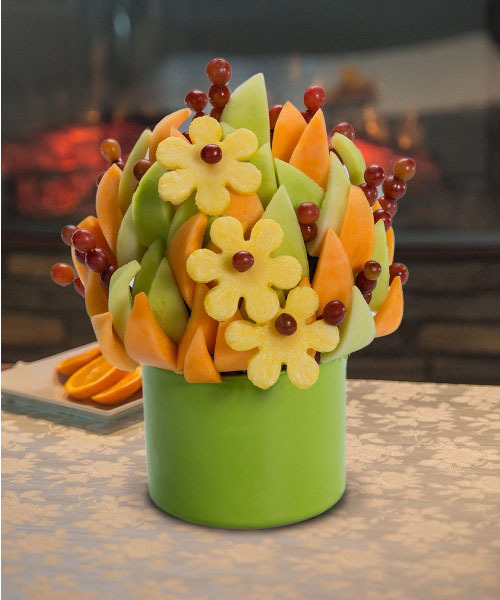 This healthy arrangement features pineapple daisies, cantaloupe, honeydew melon, grapes, and strawberries. 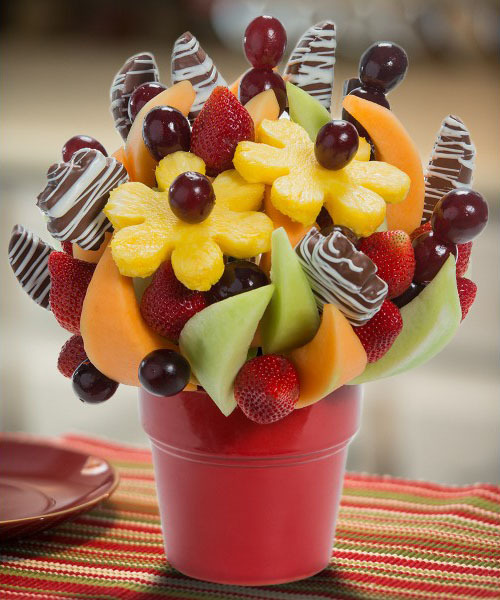 An array of fruit with a hint of chocolate that is sure to please everyone! 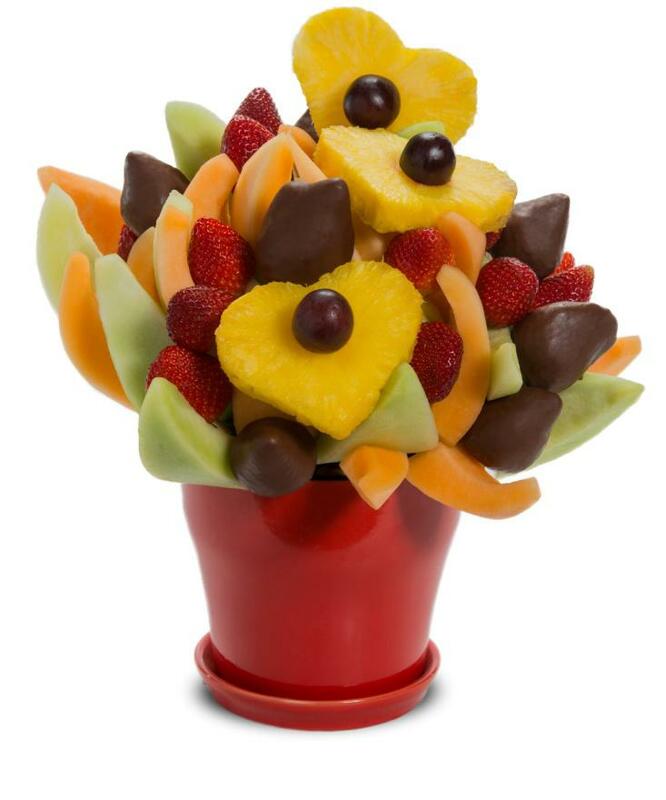 This colourful arrangement offers pineapple daisies, cantaloupe, honeydew melon, grapes, plain strawberries, and a few chocolate dipped strawberries! Our most popular bouquet! 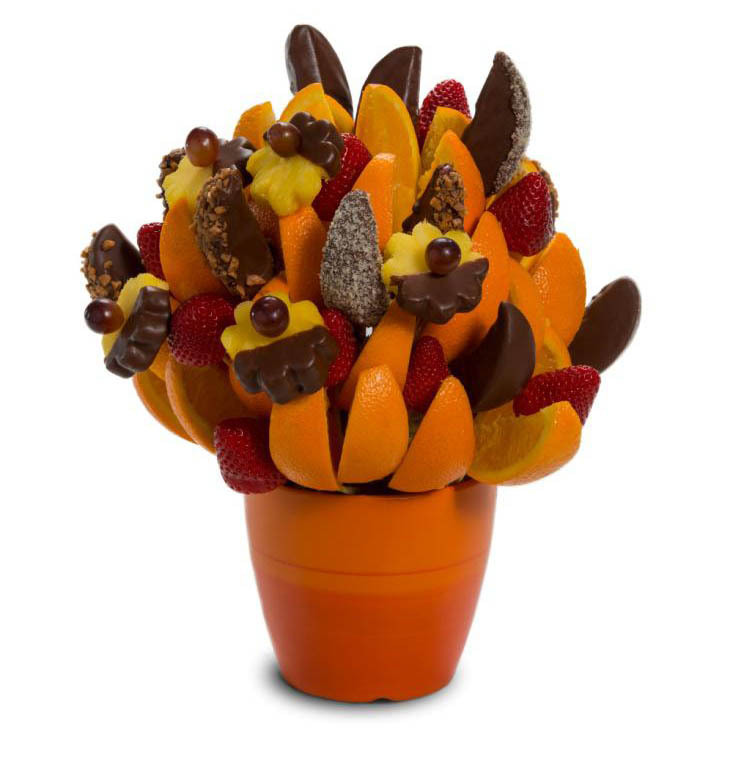 Embrace temptation with this luxurious mix of fresh fruit and chocolate! 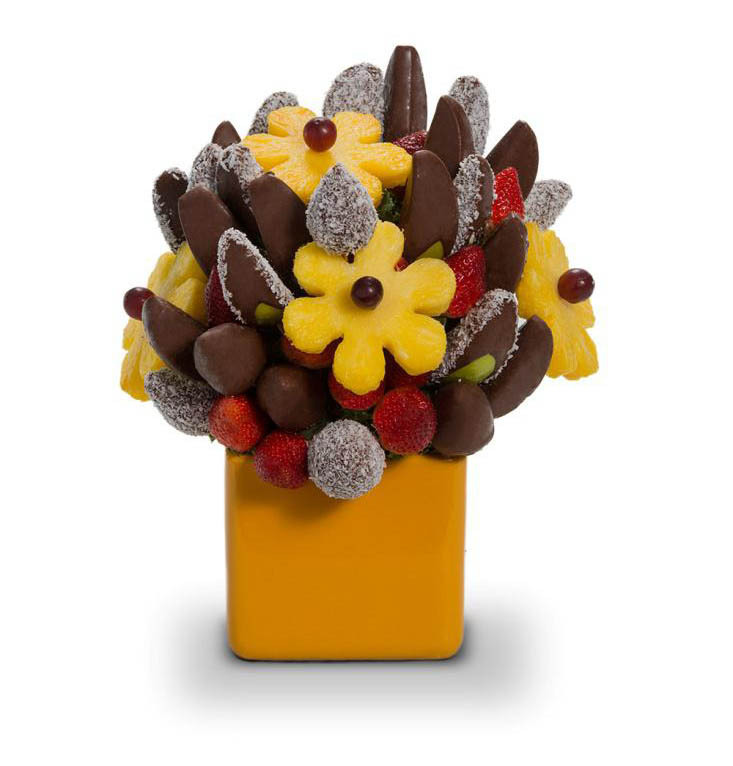 A sweet arrangement of pineapple daisies, plain and chocolate dipped strawberries, chocolate dipped apples covered in almonds, coconut and chocolate cookie crumbs. Absolutely mouth watering. These pineapple stars are within reach, but can still be wished upon. Make someone’s wishes come true. This is the perfect treat for a hard-working person! 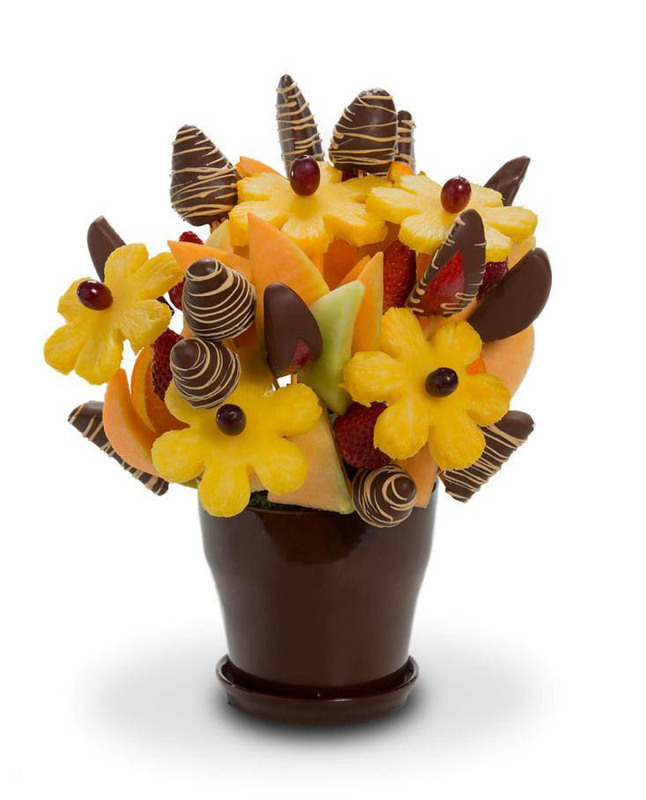 An arrangement featuring pineapple daisies, cantaloupe, plain and chocolate dipped strawberries and chocolate dipped apple wedges swirled with white chocolate. Yum. Did you know that fireworks date back to the 7th century in China? Give that special someone the Fireworks Blossom to celebrate their festive occasion. Be it a new job, new house, graduation, or a baby. The possibilities are endless and as unique as fireworks themselves. A great gift for any special occasion that is perfect for your sweet tooth! 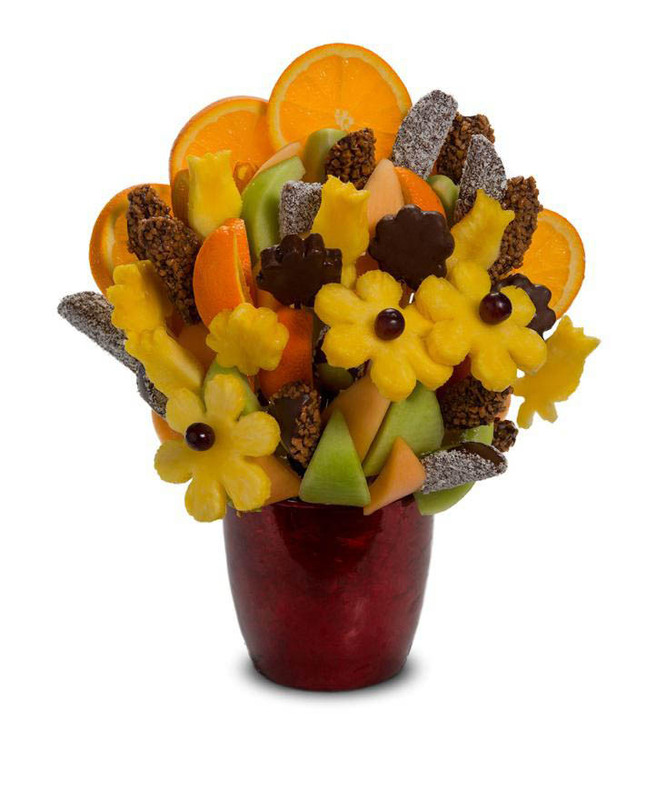 Pineapple daisies, grapes, chocolate dipped apple wedges, and plain and chocolate dipped strawberries come together to create this beautiful arrangement. 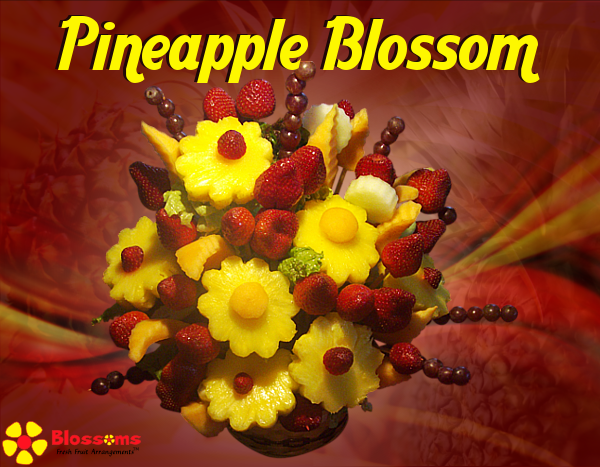 The perfect Admin Day Blossom for any pineapple lover! 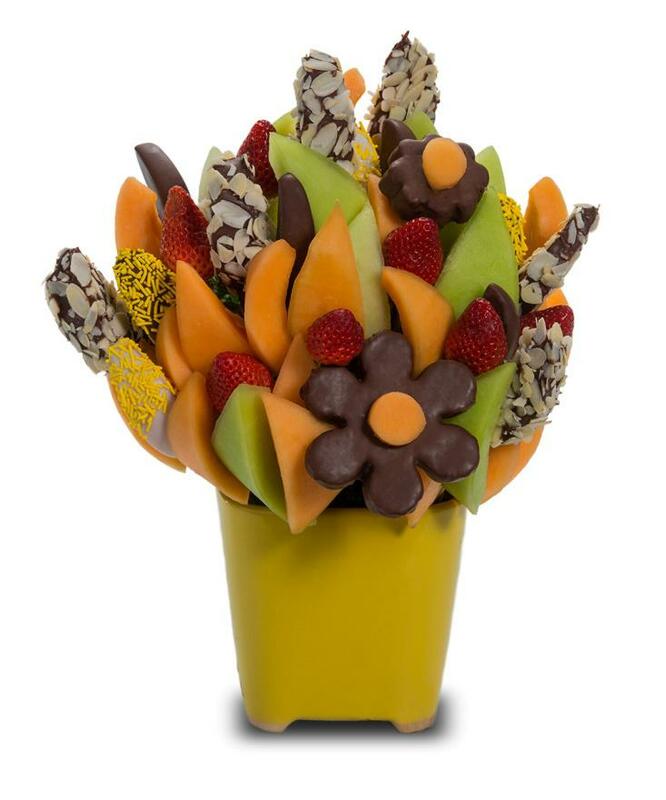 A brilliantly bright bouquet featuring plenty of edible pineapple daisies, cantaloupe, and strawberries! This is the perfect “pick me up” for that 2pm slump, send a healthy sweet treat to perk anyone up. It’s great for book clubs, tea parties, dinner parties, or even meetings. A beautiful assortment of fresh fruit for everyone! A very popular Blossom that is perfect for any occasion! 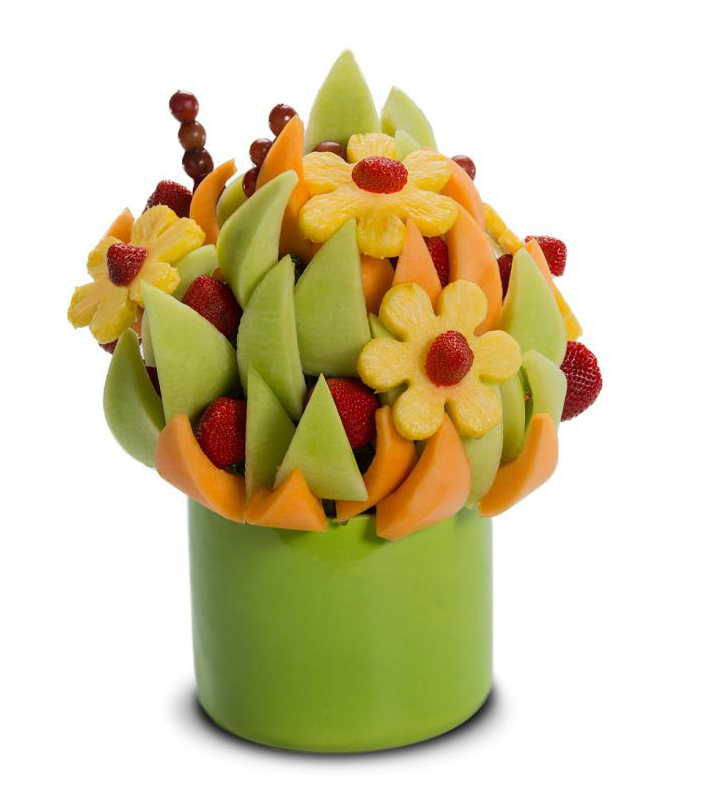 This arrangement features strawberries, grapes, cantaloupe, honeydew melon and plenty of pineapple daisies. 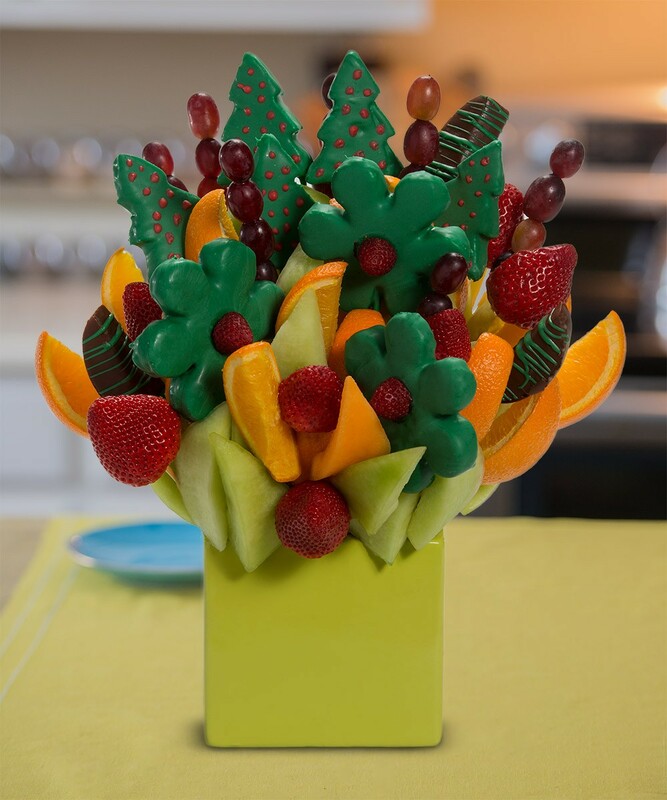 This is a great party centerpiece and pairs well with a fruit arrangement. This is also an awesome centerpiece for weddings! 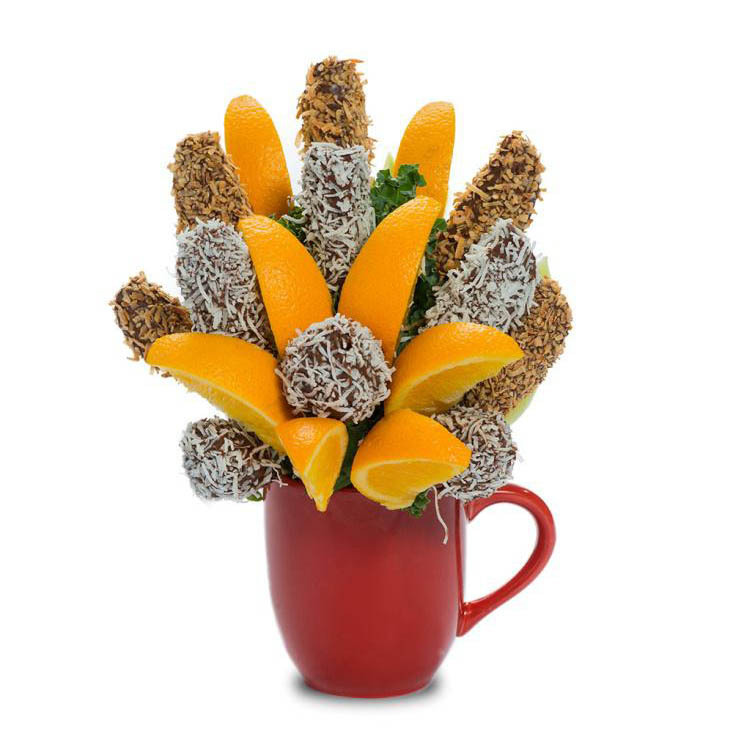 Beautiful bouquet of fruits, dipped in chocolate with coconut coating. It’s fresh and could be a center piece at any party. I recommend buying one for a baby shower, weddings just to show off a good edible piece of artwork. It’s amazing! They are beautiful and delicious, almost too pretty to eat. Lucky Kamloops!!! Trying to stick to your healthy eating plan? This treat will keep you on track but still taste like your cheating. 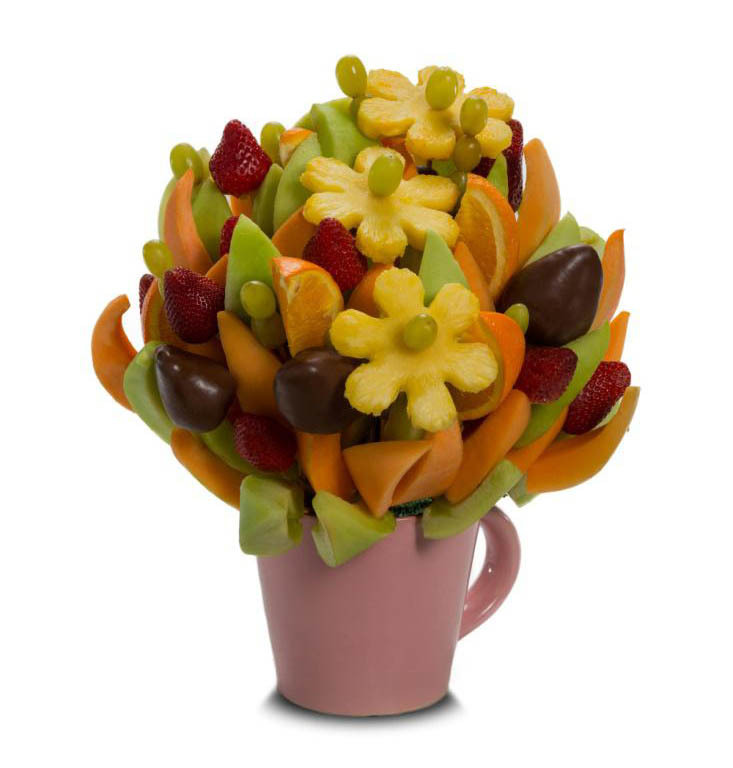 It’s filled with honeydew melon, cantaloupe, strawberries, grapes, a pineapple daisy and a few chocolate dipped strawberries. This flowery Blossom is full of sweet delights! 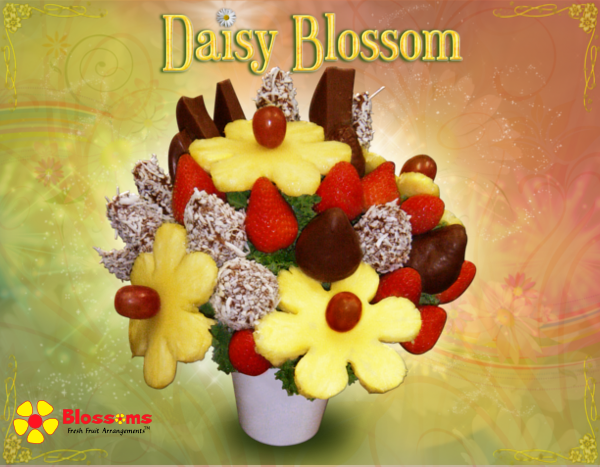 Satisfy anyone’s taste buds with chocolate-dipped apple wedges, plain and chocolate-dipped strawberries, and pineapple daisies! Choose to have your dipped fruit rolled in coconut or another topping! A great choice for your special person. 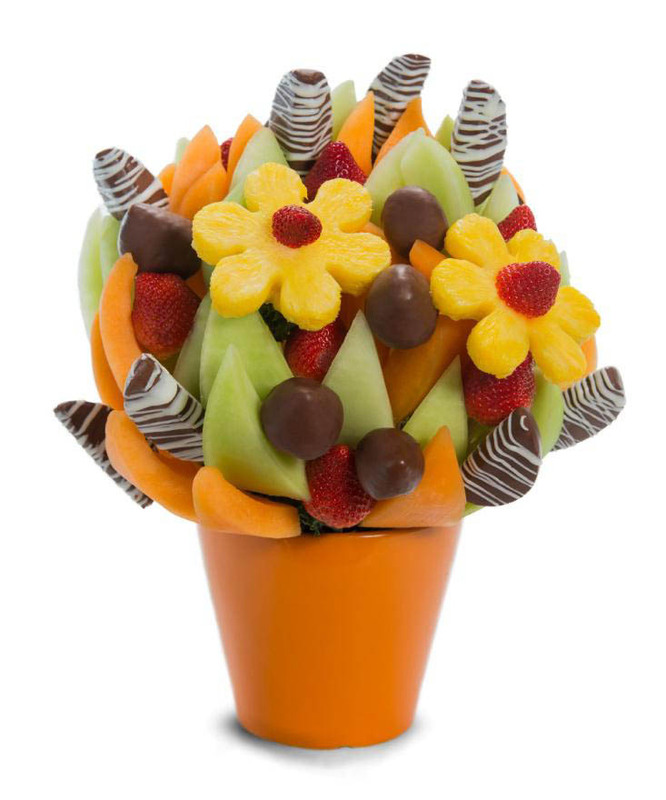 Pineapple flowers, berries skewers, fresh chocolate dipped strawberries, oranges and honeydew melon. Yum! 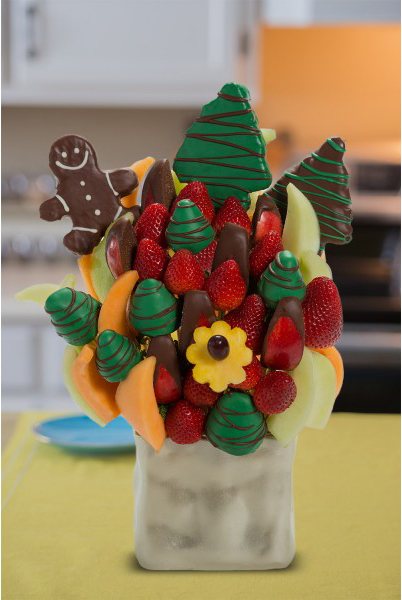 Satisfy your taste buds with this delectable arrangement. 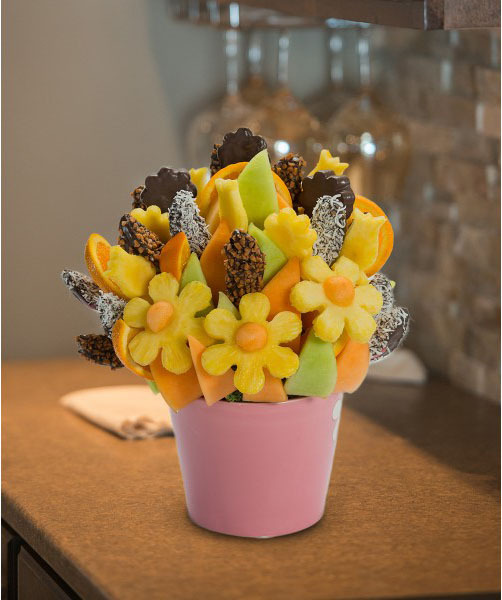 The Chocolate Dipped Apples Blossom consists of honeydew melon, cantaloupe and strawberries, complimented with a chocolate dipped pineapple daisy and apple wedges. Everyone deserves star treatment; let the star in your life know their wishes do come true. This is a great gift for anyone on your holiday list. 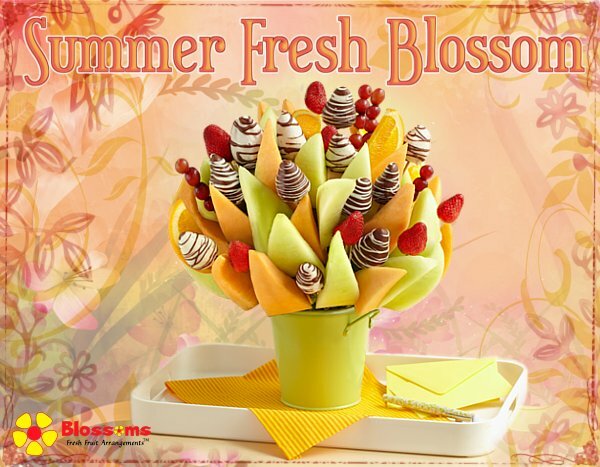 A Blossom that features both fresh and dipped fruit that is perfect for any occasion! 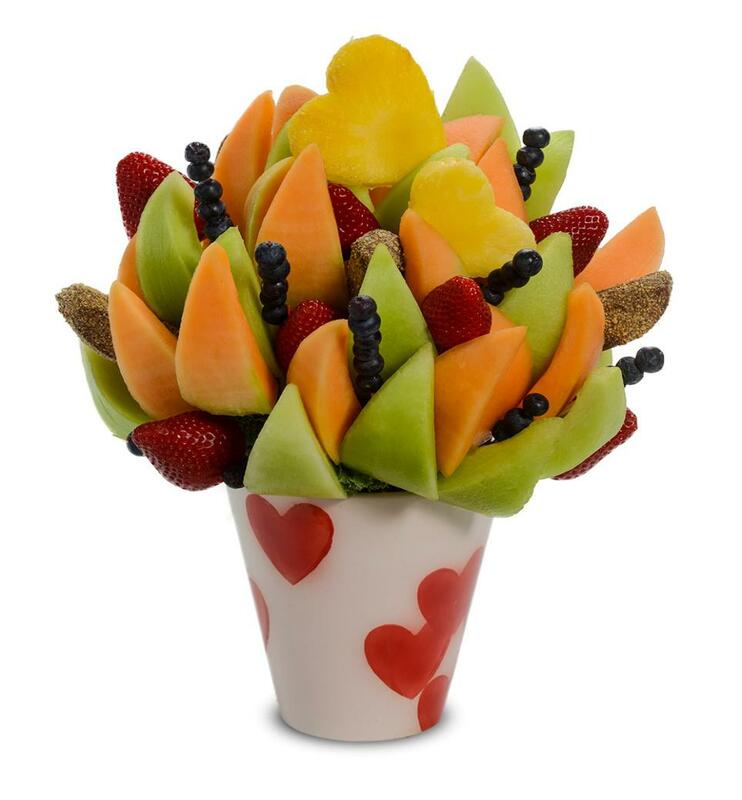 A colorful arrangement offering pineapple hearts, cantaloupe, honeydew melon and both plain and chocolate dipped strawberries! 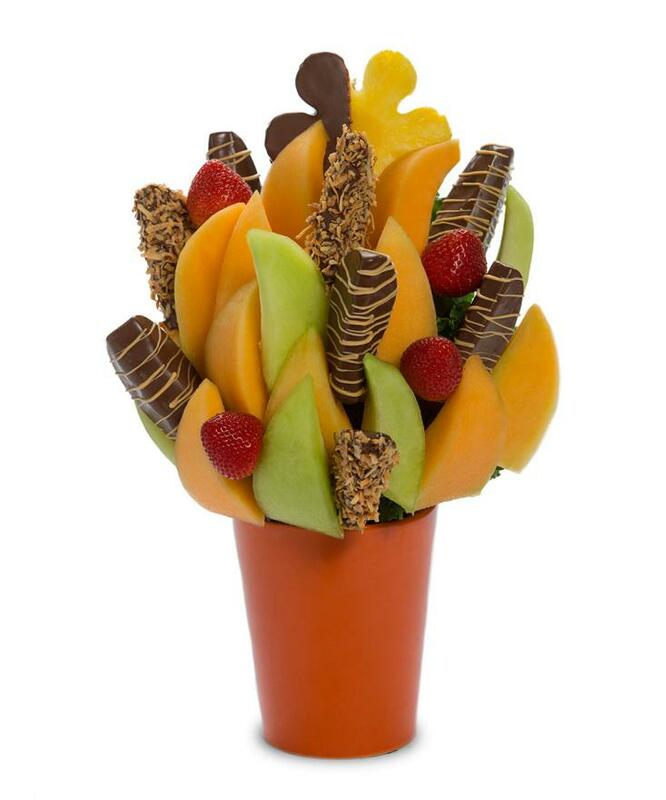 This is a health packed arrangement, full of strawberries, honeydew melon, grapes and oranges. Perfect for that health nut in your life. 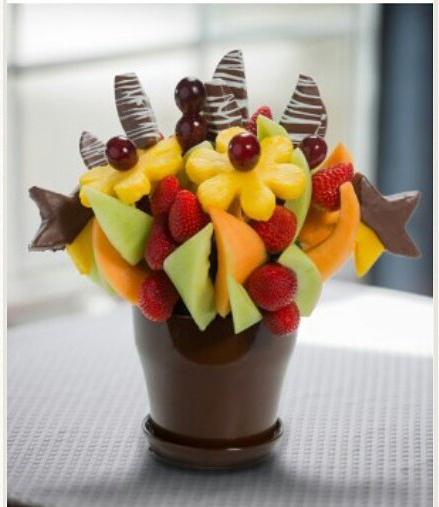 This is a beautiful luscious array of fresh fruit coupled with chocolate dipped apples, great for any party. Summer BBQ’s on the back deck? Try nibbling on this while your guests await the steak. It’s a great addition to any party. While everyone else will bring wine or beer, stand out with this gift they won’t soon forget. Summer is here to stay with this cheerful, fruity Blossom! 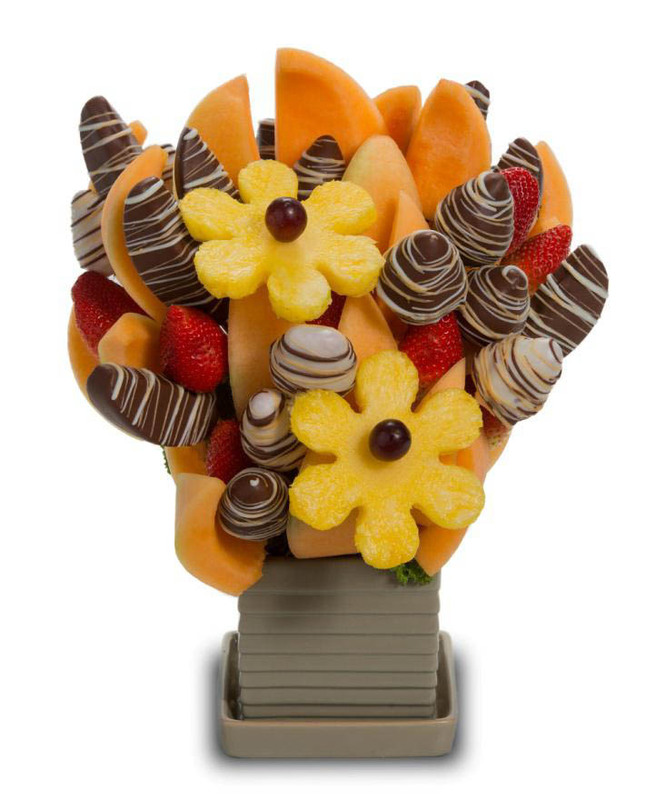 Bring the taste of the tropics home with this arrangement filled with cantaloupe, honeydew melon, strawberries, orange wedges, and chocolate dipped pineapple daisies and apple wedges rolled in coconut. This is a great gift for almost any occasion, that hard to buy for person, a thank you, congratulations, etc. Whatever the occasion, its a great choice. A perfectly bright and happy Blossom for spring! 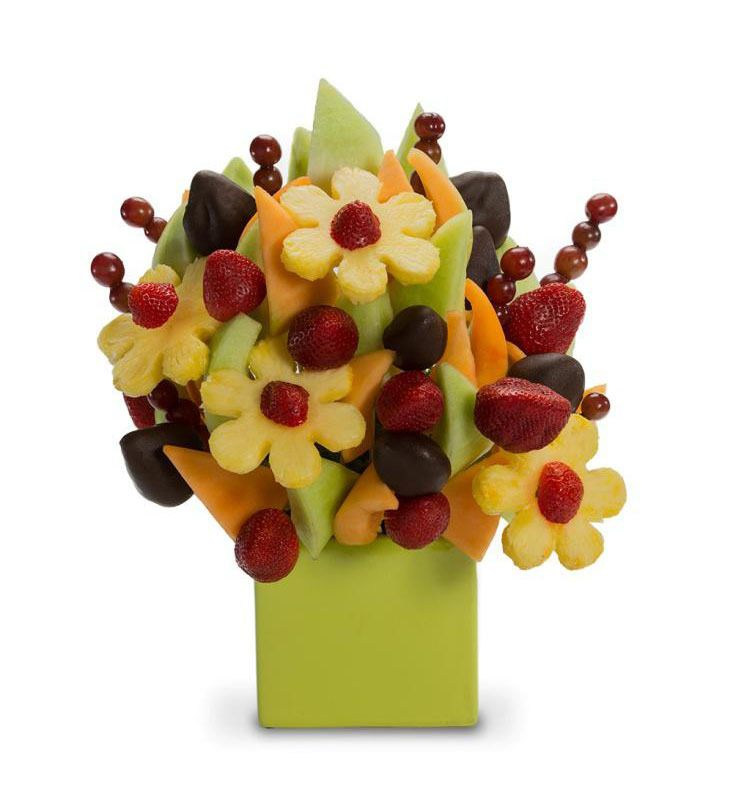 Put a smile on anyone’s face with pineapple daisies, grapes, cantaloupe, and honeydew melon! This arrangement is packed full of freshness! Sun, blue skies, and warmth describes a beautiful summer day. Everyone is looking for something refreshing to help beat the heat. What a great way to quench that thirst. What a perfect way to welcome spring! 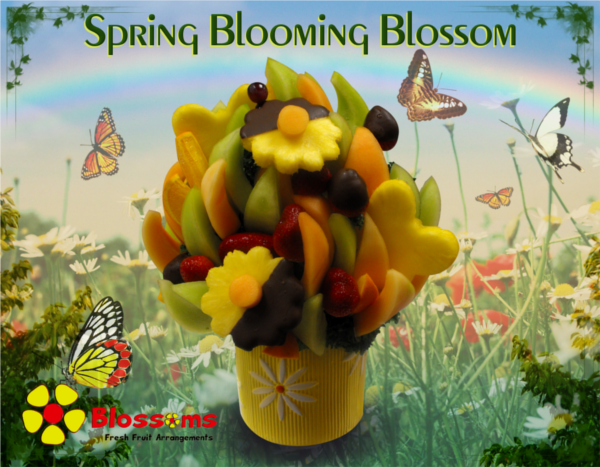 This cheerful and bright Blossom offers pineapple butterflies and chocolate dipped pineapple daisies, cantaloupe, honeydew melon, orange wedges, strawberries, and grapes. Crisp air, a breath of fresh fruit! Enjoy this delectable Fall arrangement. Succulent honeydew melons, fresh strawberries, golden brown chocolate dipped apples, drizzled with butterscotch. The perfect autumn treat! Wood fire, crisp apples, cool air, now this is Fall. Made and order for the wrong day, called back and they changed it for me no problem! I called the same day I needed the order changed and they completely delivered! 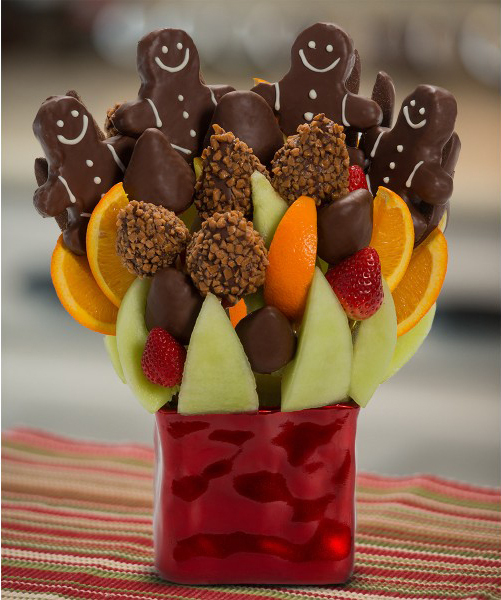 Hip hip hooray, send this lovely fruit arrangement filled with chocolate dipped apple wedges and clusters of almond slices. Great for a new job, a job well done or just a special treat at the office. During Chinese New Year, apples mean wisdom and peace, melon means family unity, pineapple means wealth and luck. Send this arrangement to wish someone good luck. It’s packed full of pineapple daisies and tulips, sure to bring prosperity and luck to all. When you can’t be there and they’re in your thoughts, this will remind them you’re thinking of them. Have someone in your office that does a great job? Do you want to tell them how much you appreciate them? This is better than a box of chocolates, or flowers. 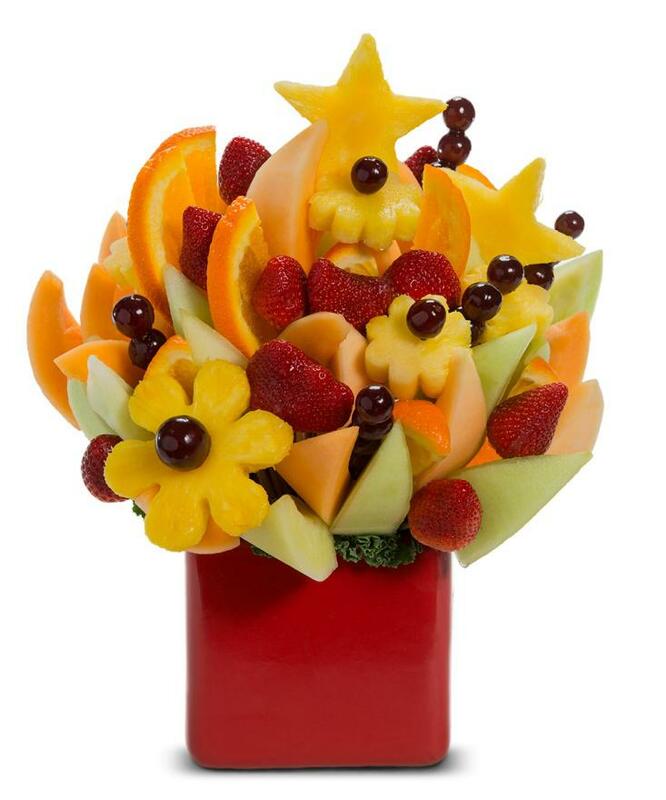 Send them a fruit arrangement-it’s the perfect gift! They will share it around the office and tell everyone how awesome you are! Is there someone you know not feeling quite themselves lately? Or perhaps they are in the hospital. What a great way to show them they are loved and cared for. 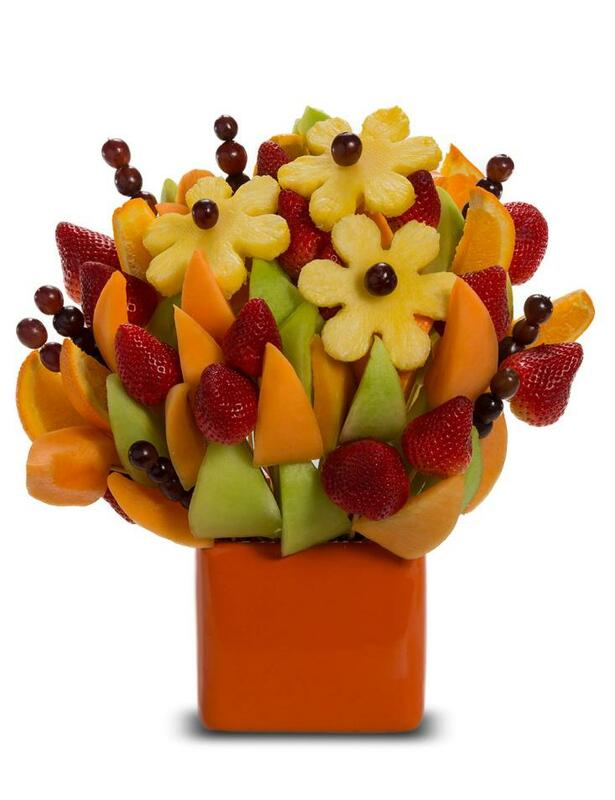 A deliciously delectable blossom with honeydew melon, cantaloupe, and orange wedges; along with strawberries, grapes, pineapple hearts and daisies. A wonderful way to show someone you care. Do you have a special client or staff member you want to appreciate? This is the perfect choice for staff meetings to perk up your team.